The North Pacific LCC Conservation Planning Atlas is a data discovery, visualization, and analytical platform for stakeholders throughout the NPLCC area. With the CPA you can search for spatial datasets, visualize NPLCC supported projects, and learn more about landscape scale conservation science and design in the region. Click on an ecoregion in the map below to access more data and tools in that area. We are pleased to announce the launch of the West Coast Estuaries Explorer. This application lets you easily explore the latest available data for estuaries in California, Oregon, and Washington. May 15 - Willamette Valley Conservation Study Explorer Launched! 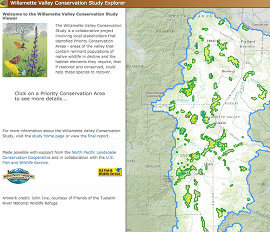 We are pleased to announce the launch of the Willamette Valley Conservation Study Explorer.